I thought all of my Thanksgiving Test Recipes were done, cystitis but I got inspired to make these little hors’ d’oeuvres this morning and decided to share, in case anyone was still looking for some appetizer ideas. I still have the dates that Oh! 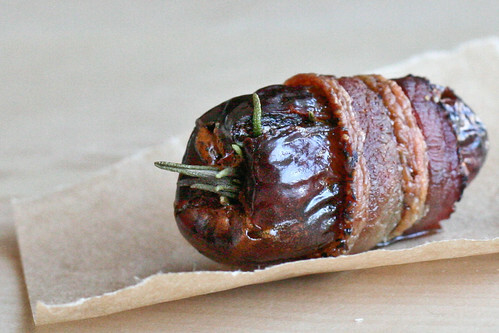 Nuts sent me awhile back and everyone loves a bacon-wrapped date, and especially one that’s been stuffed with rosemary. I tested a couple of these out while I was baking pies (many, many pies), and they were as delicious as I’d thought they’d be. They’re really easy to make – just stuff the dates with rosemary leaves, wrap in bacon and bake for a half hour. An easy hors’ d’oeuvre that’s still impressive and addictive. Preheat the oven to 375°. Pit the dates by cutting a slit into one side and removing the pit. Stuff a few rosemary leaves into the date, then wrap with the halved bacon slices. You can close them with a toothpick, or not (I didn’t have any). Bake for 30 – 35 minutes, or until the bacon is browned and crisp. Remove from oven and let cool for at least 10 minutes before serving. ooh, they’re also good stuffed with almonds :) happy thanksgiving! I love these. They are delicious!!!!!!!!!! Yum! I usually stuff mine with either cheese or nuts, but never rosemary. How interesting! I have never seen this before, I am looking forward to trying these out in September with fresh medjool dates. I wonder if you could use some precooked bacon and cook this faster. Like the precooked bacon they sell at costco. It has less fat and it cooks to a nice crisp much faster. I love gourmet/delicatessen type places too….! I’m a cheese-aholic!! I will use your marvellous date and bacon nibble at the jewellery party that I – foolishly – put my hand up to host. I was panicking, not knowing what to offer people. Thank you!! ..sorry….just noticed that you like stout….me too! Love a nice glass of Guinness! I think it would go great with the date’n’bacon nibble, too. OK, Melissa, I’m finally unsubscribing from your blog’s RSS feed. I’m tired of all this drool winding up on my keyboard.